It is a time of mercy for the families of the world. 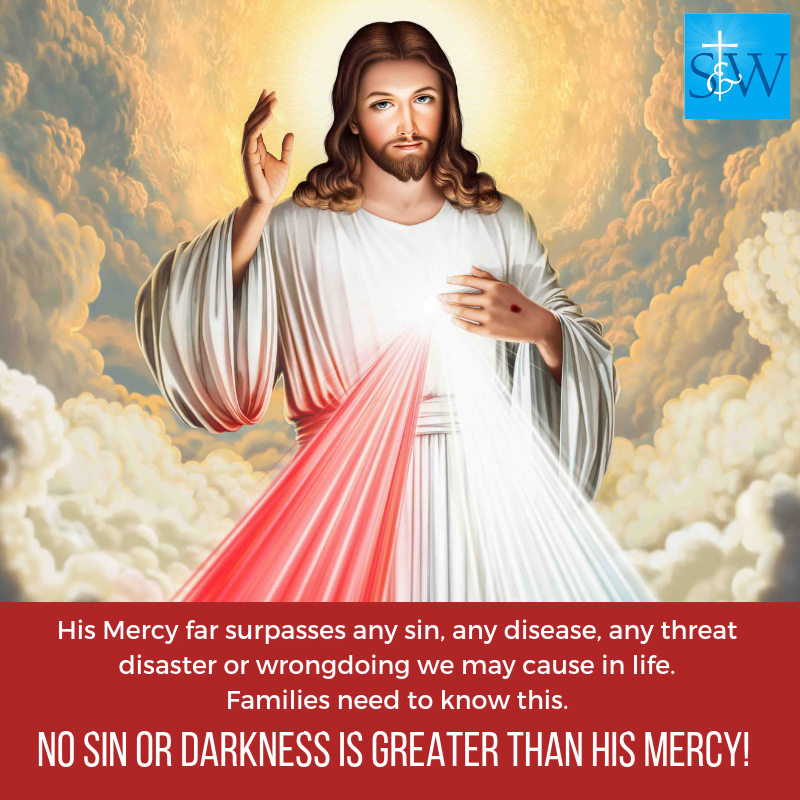 I am beginning to understand and, after pondering these things, I am convinced that the Divine Mercy for families is one of the foundations to the Divine Mercy devotion itself. Without the family we do not have hope. The family is society; the family is the Church. The family is the future which is under threat and division. 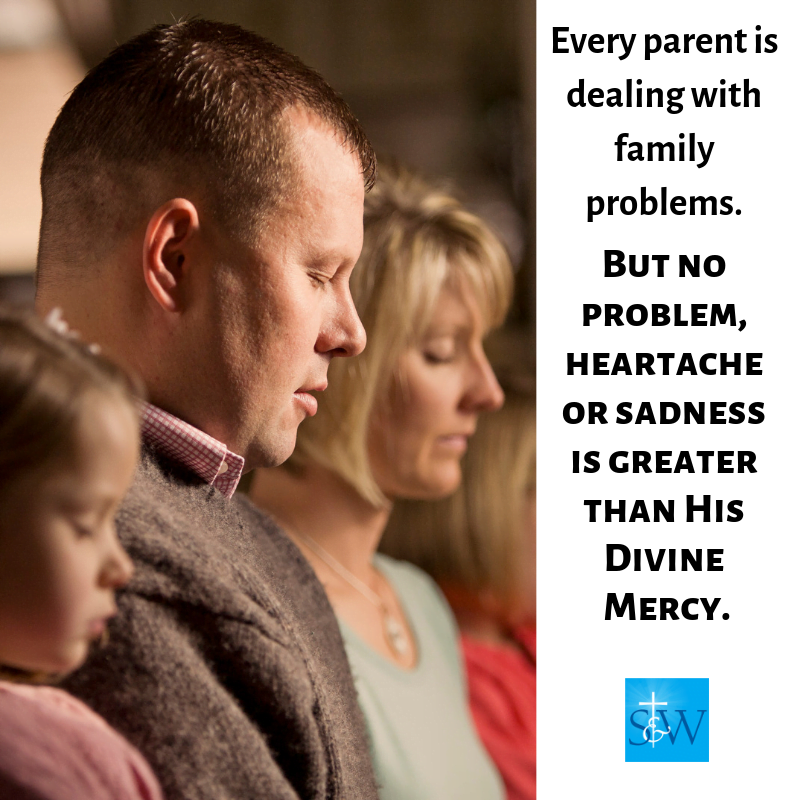 Families today are in desperate need of God’s mercy. I’ve discovered that when I recommended this consecration prayer to any family anywhere in the world, something takes place during that prayer. The power Holy Spirit comes down. I’ve witnessed many tears; those are the tears of healing. It is because the prayer is a generational healing prayer. God’s mercy has no boundaries. God’s mercy has no time. The prayer encompasses the abandonment of our families, past, present, and future into the control and care of God’s infinite mercy. This is extraordinary because this is exactly what happened at the passion, death, and resurrection of Our Lord. He took everything and everyone from the beginning of time to the end of time, and He reconciled them to Himself. So when we take our families and we commend them to God’s Divine Mercy and we consecrate them, we set them aside and say “Lord I place them into your wounds and into your merciful heart.” He takes our families and it’s like Baptism, unless we freely decide to reject Him, we remain in His Heart forever. He will never let us go. By life’s circumstances, our families might come right to the edge of death or disaster, but He will never let you go. His Mercy far surpasses any sin, any disease, any threat disaster or wrongdoing we may cause in life. Families need to know this. No sin or darkness is greater than His Mercy! I’ve seen mothers and fathers in churches weep and they say, “Do you know about my children?” Yes, we all know it. Every parent is dealing with family problems. But no problem, heartache or sadness is greater than His Divine Mercy. One of the fruits of my priesthood has opened up to something in which I have no control over, but God is using me for something in His plan for the family. I don’t like to say no to God and I believe that He is using my constant yes in an extraordinary way. It comes at a cost I must add. 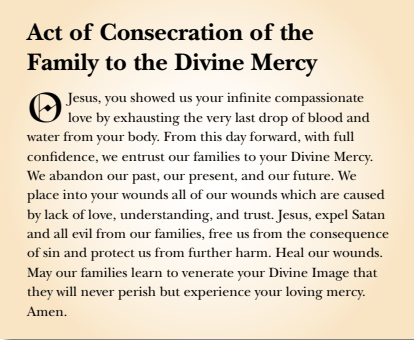 The Act of Consecration of the Family to the Divine Mercy is something that I know has been in His mind a long time. For whatever His wisdom, He called me on pilgrimage to Medjugorje in order to take on an invitation to the priesthood. For whatever Her wisdom, Blessed Mother of Mercy also saw something of value in this “nobody” from Brooklyn. I’m very humbled at the magnificence of God’s work and how God has used my priesthood. Since the act of consecration has been introduced, I’ve received testimony about families that have begun to reconcile with one another and about marriages in which spouses are considering appropriate communication again. I know of a few children that have requested to enter rehab programs. Families are continuing to be healed. 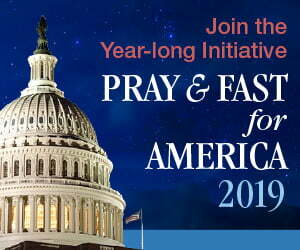 Many families have decided to pray the consecration prayer every day. It strengthens them in the daily task families experience each day. God’s power is working; He has given a prayer for generational healing. Perhaps a long deceased family member is the cause of something difficult happening now, (perhaps by a curse or a poor legacy passed down) this can be healed so that wound will not continue to remain open from generation to the next. God’s mercy just continues to flow over. Many have asked how this Enthronement of the Divine Mercy is different from the Enthronement of the Sacred Heart. Jesus said to St. Faustina “I have chosen you to be my apostle for the last times.” The Sacred Heart of Jesus is still equally powerful, but when He decided to give the Image of the Divine Mercy to the world, He was ushering in an era of mercy; an era that is changing the destiny of humankind. Look at our world. Every family screams for mercy. When Jesus asked for the image to be painted, no matter how insufficient it was in St. Faustina’s eyes, the Lord accepted it. Jesus talks about the image being miraculous and powerful. He placed a condition of our trust attached to the miraculous Image. We are asked to trust in His Mercy in these troubled times. Read Fr. Dermot’s whole article here! Read more from this magazine, 24#1/2!